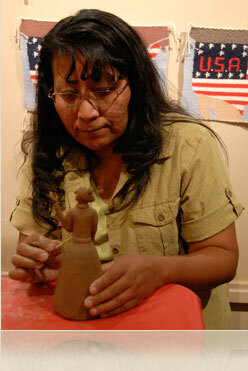 The work of Navajo folk potter Elizabeth Manygoats is one of my most exiting recent discoveries. Elizabeth is a rare example of a self-trained artist whose work expresses the day-to-day culture on which it grows. She is part of a large Navajo family living in a remote area of Northwestern Arizona. While Elizabeth’s mother and nine sisters are also potters, Elizabeth is the only family member working full-time as an artist. Her pottery features herders on foot and horseback with livestock against a backdrop of desert mesas and solitary log homes. Elizabeth creates freestanding figures as well as bowls and jars featuring figures in relief. Whimsical tiles are an Elizabeth specialty. As is common to all Navajo potters, Elizabeth places a final slip of pinon resin on her completed works. 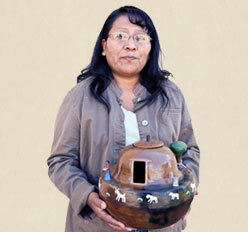 Elizabeth is holding a pottery depiction of a traditional Navajo house or Hogan. Elizabeth working on a clay figure.